Have you heard about those corset waist training belts? You tighten and tighten the belt and it makes you waist whittle away all the while squishing your internal organs into odd places. Some people swear by them. That is how they claim to achieve the golden hip to waist ratio of 0.7. You know, 36-26-36 which then became 34-24-34. This post isn’t about those kind of belts. I’m talking about regular belts. The kind that let people know you still have a waist but you aren’t interested in playing musical chairs with your internal organs. when I see myself in the mirror. This was so comfy without a belt! Once I returned from a fruitful day of thrifting I decided to take some photos of my outfit. Upon reviewing the photos I realized that somehow the mirror had outright lied to my face. The outfit added the weight of an entire other person to my frame. May I introduce you to, “Super Sized Me”. Obi belt to the rescue. 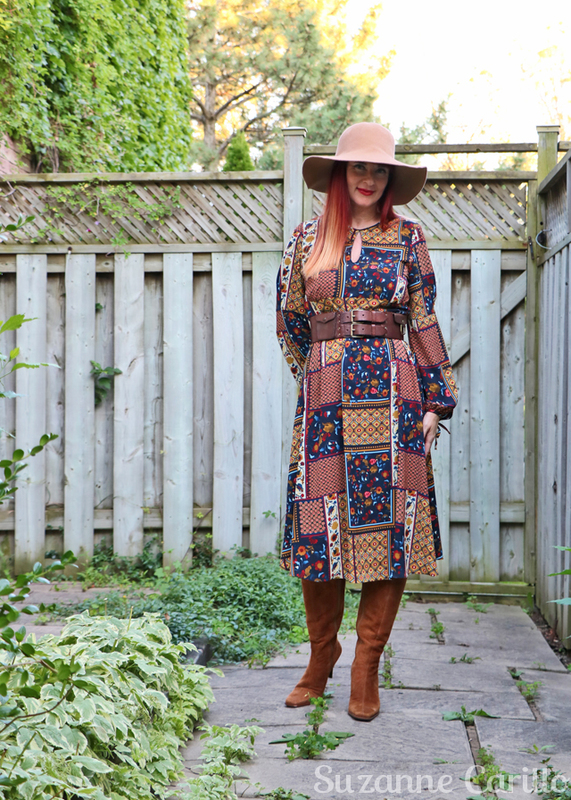 Dress – thrifted Talize, Sweater Coat – thrifted Talize, Boots – TJ Maxi, Obi belt – very old. I should have belted over top of the sweater coat, it would have looked better but I found it too hot. 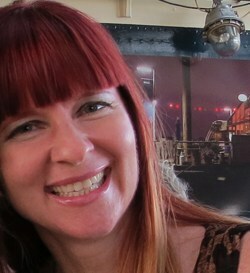 It’s still really warm here and the dress is polyester. I didn’t need another meno melt down. I had hopes of keeping this sweater coat but after seeing that it requires belting on me I don’t think I will. These are curvy body type issues. If you have a model’s body type look away. You don’t need help. Below is another dress that had the same issues. I tried it without the belt at first but Normal Me threw a temper tantrum and said Super Sized Me was stealing all her sunshine. The great thing about this oversized wide belt are those extra little pockets. Perfect for breath mints, a Loonie or one of those little floss sticks. I eat granola bars in the car on my thrifting days instead of stopping for lunch and I’m always getting little chia seeds stuck in-between my teeth. Zoë insists the pockets are there for pug treats. Who am I to rob her of her dream? 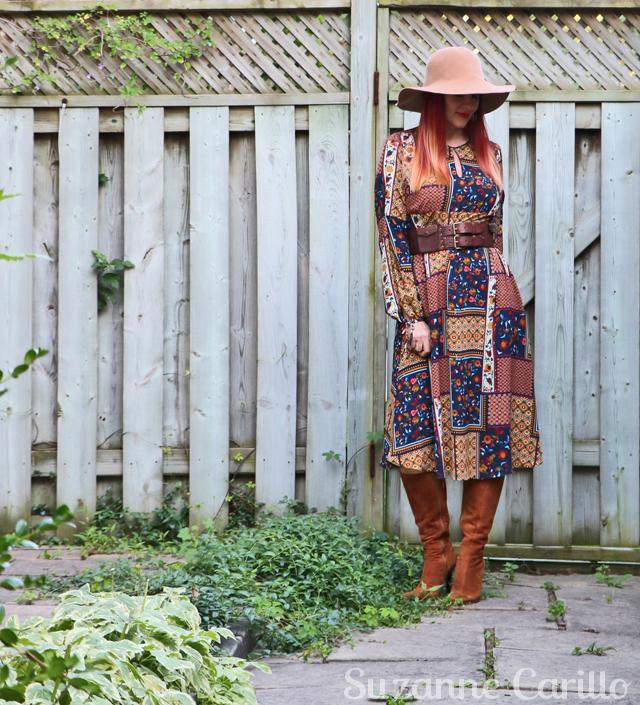 Dress & boots thrifted – Talize, Hat & Belt via consignment. 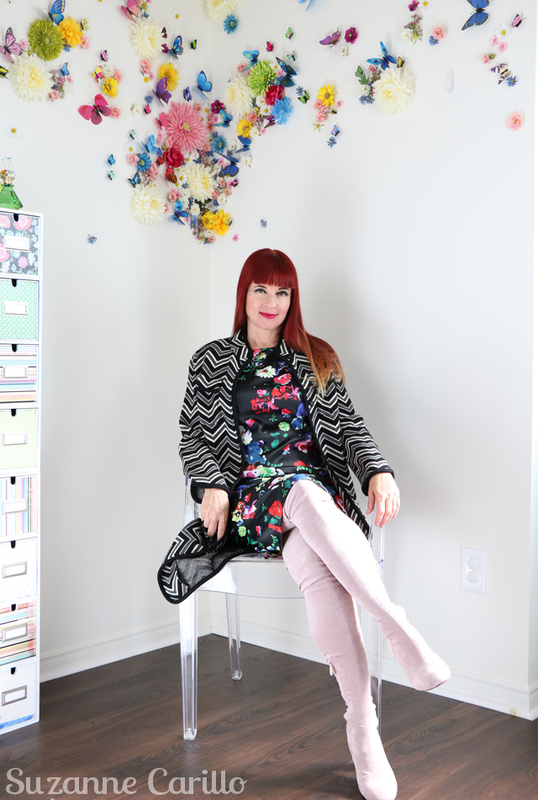 This patchwork dress I rescued was originally from Zara. It reminds me of a Holly Hobbie doll I painted as a kid. Remember those? I switched out the bonnet for a floppy hat, the practical work boots for some impractical suede boots and added an oversized belt instead of the apron. I forgot my long bloomers too. A beltless life is a more comfortable life but forgetting about one’s waist can land you in trouble. 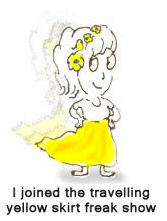 When I was illustrating full time I worked insane hours from home. This was at the same time that I was at chef’s school. I went a couple of years essentially wearing yoga pants and lost my waist entirely. One day I looked in the mirror and it had just… disappeared. I happened upon a scale while shopping at Costco and in desperation thought it might give me a clue as to wear I’d lost my waist. We didn’t have a home scale at that time. If you haven’t stepped on a scale in over five years do not, I repeat, DO NOT use the one in Costco or any public place for that matter. It ain’t pretty. At first I thought the scale was broken. I kept getting off and then getting back on. I’d put one toe on it and then make sure it went back to zero. Then I’d get back on again. It was still wrong! Nothing changed that insane number which was clearly someone Punking me! This is when that phrase “Reality Bites” up and slapped me upside the head. Thirty five pounds had crept onto my body when I wasn’t looking. It sat right where my waist used to be. That was not a fun moment my friends. It wouldn’t be the first time I’ve heard of someone having a mental breakdown at Costco. Needless to say I don’t think I bought many groceries that day. How did I actually find my waist again? The old fashioned way, exercise and deciding that I probably shouldn’t bake every day. At one point in time during my chef’s school I remember having the choice of five different desserts to choose from in my fridge at home. I had to remember we were just a couple and not a restaurant. But I digress. Belts are a necessary evil for me. They remind me where my waist should be and keep me in check. They ensure the Normal Me is still the reflection I see in the mirror and camera. Are you a fan of belts? Do you find that they help define your shape? Or have you moved past caring? I’m kind of short waisted, I think that might be part of the reason that belts help out my figure. We have the opposite figure type. I am tall, slim, large waisted, long bodied and small busted. Straight up and down. Belts on the hips work for me sometimes. I have IBS and when bloated belts do me nooo favours! Ha! In fact belts in the wrong place MAKE me bloated. What?! Holly hobby all grown up! I used to draw her as well. I adore the belt with pockets, although they add a thickness to the middle I could do without. Try that coat with black skinny pants. Seeing your leg division might be enough to reduce your sillhouette. It is too stunning to let go! You are right, that coat does look good with skinny jeans but I need something that works all the time. Not enough space left in my closet anymore for anything less. Well I thought of you right away when I wrote this post since I know you often belt over your cardis which is something I do too. I’ll often wear really long pendant with a flow-y outfit to subtly draw the attention to my middle, I like belts when I wear maxi skirts with tight fitting tops but I’m not keen on the fabric bunching up when I try them with dresses. Love the Holly Hobbie dress and the pocketed belt. The floppy hat’s a far better option than the bonnet although you’d probably look fabulous in one anyway!! That is a good idea with pendant! Funny enough when I worked at our ice cream shops I still ate a ton of ice cream even though I was surrounded by it daily. I think if I decided to work as a chef I probably would have felt the same way as you. Belts are fabulous, and ALL pockets are for pug treats, yeah? You look gorgeous with and w/o the belts, but they do give your already fab figure another gold star. I just read the model’s measurements at some Nordstrom site, and they were 30-24-34. The incredible shrinking women!! Yes…the incredible shrinking woman. No wonder I can never fit into anything the same way the models do! 1. I love hearing your thoughts on fashion and appearance because they teach me so much. 2. For someone with cylindrical shape (i.e., no curves), belts can create the illusion of a figure. 3. So sorry to hear about your melt-down. I’ve faced similar crises. Yes belts are a good tool to have in your tickle trunk. What’s a tickle trunk? You need to look up Mr. Dressup, my favourite program as a child. He had a trunk where he kept all kinds of fun dress up clothes to play with. Okay, I’ll be honest. I kinda lost track of what you were saying once I laid eyes on those pink boots…those are perfection my friend! 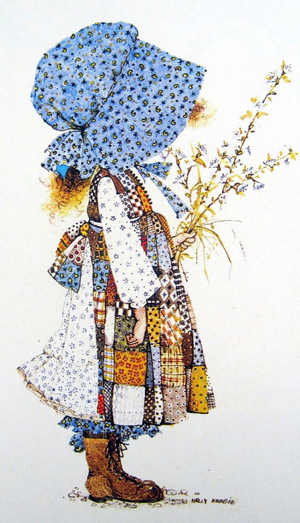 Although Holly Hobbie caught my attention again…I remember her. I had one of those little kid painting kits with a picture of Holly Hobbie. And let’s not forget the puffy sleeved tie back blouse with graphics of her all over it…lol! I think we all must have had one of those painting kits. I think that may have been where my love of patterns came from. Her dress was full of them. Those boots would look amazing on you! It’s funny how many women don’t believe in belts. Like my stepmom (the 60+ model), and I realize that “they” say for some shapes you shouldn’t wear them. But I think they can be so helpful so many times!! It’s like a sign that says “look at me”, right? And as ever you had me chuckling all through the post, Suzanne!! That always helps the waistline too!! I think what lots of more advanced women believe is that they need to wear the belt lower, on what may well be the largest part of their body which isn’t a good move. They don’t realize they can wear it just an inch or two below their chest which works. You look fabulous here Suzanne, truly. I love the sweater and dress combination and do not think it is too much for you. I just think you need a strategic hand on your hip stance. Subtle shifts in our posture and posing can make all the difference. I also love the wide belt on you and the patchwork dress. It’s all beautiful. I can’t remember the last time I baked. But with the winter coming it sure sounds tempting. Have a wonderful week. I stayed away from doing any kind of strategic hand placement because I wanted to see what I looked like in real life walking around as I did that day. I am not caring too much! You are stunning! Love the look! Belts are a gift as far as as I’m concerned. Not only do they create a waist where one is lacking but they are a snazzy accessory. You can build an entire look around a belt. Like hats they’re sort of thematic and are really body jewelry! You like great in this little patchwork dress and those pi k boots add wonderful sophistication to the outfit. No more Holly Hobby here!! More like Holy Hannah you’re HOT!! I agree that you can create entire looks around just a belt. Especially some of the really fancy belts you see now. I too see so many great belt buckles for western belts while thrifting. I’m sure you carry of that style beautifully. I’m a tremendous fan of belts and never, even when tempted, go without one when I wear something without a defined waist. Without a belt, my curvy hips simply make me look fat. It’s the reality that I am not the willowy waif I wish I was, but a belt defines my figure in very helpful ways. I think these looks are inspiring! The boots, the Holly Hobby dress, the floppy hat—it’s all stunning. You style everything to perfection as always! I’m glad you liked the looks. I totally understand your feeling of looking fat and not being the willowy waif you visualize in your mind’s eye. When I saw that belt at the consignment store I was so worried it wouldn’t fit. Lucky for me it “just” fits. I love belts and often need one. BUT… my waist is only one inch (or so) high, which means if the belt is wide and sturdy, it hurts. And when it is soft and floppy it wil cringe. Difficult. You on the other hand look immediately beautiful when you put a belt on. That patchwork dress looks gorgeous on you. And here I thought you were long waisted. Ha ha! What do I know? So many people are buying into those waist shaping belts. I really shouldn’t have bought that patchwork dress since it’s not vintage but sometimes I give in because the item is just too good to leave behind. I didn’t find you supersized, dear Suzanne, but I get what you mean – I love a dress I have, so loose, and without a belt I look pregnant 🙂 Annd yes, a belt makes us look thinner, or at least, “more defined” 🙂 I loooved your looks, my word, this dress with patchwork pattern, how cool and beautiful! You really look fabulous! Hope you have a very nice day! Bisous! Yeah well I’d say I look pregnant but at my age that would be quite the miracle. Ha ha! 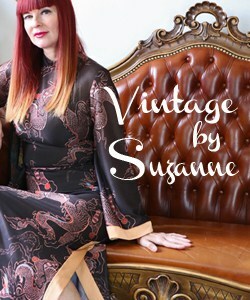 Great post Suzanne! I confess that I had lost my waist – but I’ve recently discovered that it’s still there after losing 15 pounds. 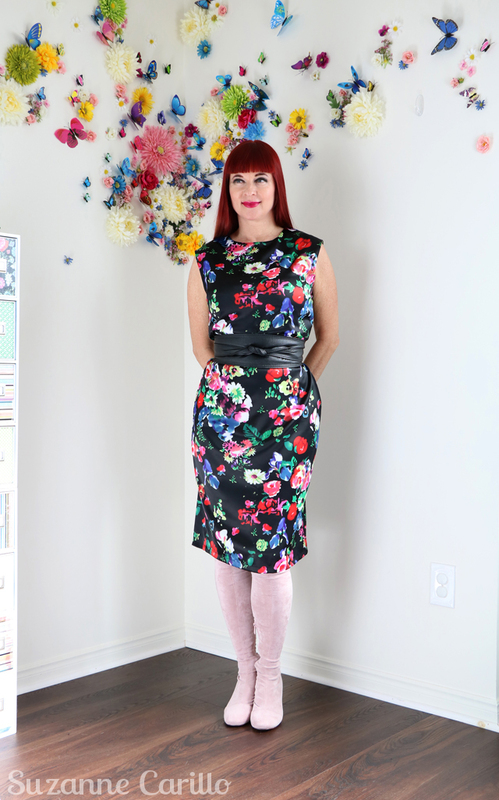 I have more to lose – but I need to stop dressing for my previous larger size. 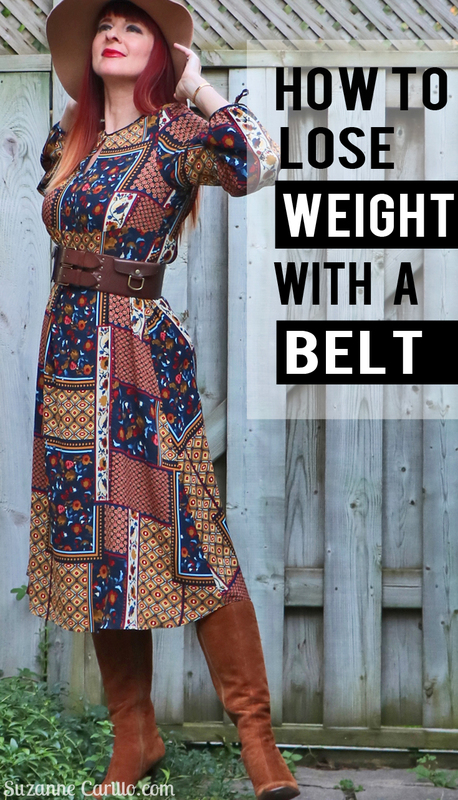 Love the belt idea – I should have tried one with the dress I have on today. I’m going to go pull my belts out and try some on! Wow! Good for you Lana! That is AWESOME! All that exercising you’ve been doing has paid off big time. Once again, I am in awe of your boots. I love belts, but don’t have enough of them. Definitely have to concentrate on building up my belt collection. That obi one is lovely. And both outfits look stunning on you. Your mention of the loonie made me smile. I never knew what they were until I was dating a guy from Ca years ago and used to go there to visit. I actually just found a few of them recently in an old purse. Still had them after all this time. Brought back some interesting memories! That is a cute story about the loonie. Funny how little things like that can trigger memories. You don’t have enough boots??? What size are your feet? I have loads of them in my shop right now. First off, the patchwork dress, with that hat and those boots, effing gorgeous on you. Colours couldn’t be better with your hair. I know that wearing a belt is one of those things that is supposed to give you the illusion of a waist but for me, it seems to emphasize that I don’t have one, possibly because I don’t have any hips to add curves below the waist. I’ve gained a lot of weight in my midsection the past 5 years and am struggling to figure out how to dress. I *almost* walked away from that dress because it’s originally from Zara. I don’t often buy pieces from fast fashion houses. The waist issue is real and I feel your pain. I’m surprised you don’t like fit and flares. They hit well above the problem area, usually just below the chest and then flare out to create volume in the hips. It’s probably a question of comfort and personal style though. You do have a very well defined personal style that suits you and your body very well. I LOVE your patchwork dress outfit! And yes, belts are such a nice finishing touch to an outfit. They do a great job of “defining” the waist, but also just add a nice dimension to an otherwise bland outfit.